Most babies are born either vaginally or via cesarean section. In the United States, about one in three births happen by cesarean section, or more commonly referred to as C-section. This rate has dramatically increased over the past few decades. According to the Agency for Healthcare Research and Quality, the number of C-section deliveries between 1997 and 2008 increased by 72%. Most C-sections do not involve a complication. However, what most people tend to forget is that a C-section is a surgical procedure, involving serious risks – both for mother and child. If you or your child suffered a complication during a cesarean section as the result of medical negligence, you may be entitled to compensation. These cases are complicated and should only be handled by a law firm that specifically handles such medical malpractice claims. 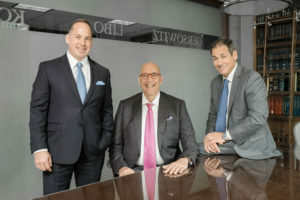 At Gersowitz Libo & Korek, P.C., our legal team has more than three decades of experience in handling all types of medical malpractice claims, especially C-section complications and injuries. A cesarean delivery is a surgical procedure in which a fetus is delivered through an incision in the mother’s abdomen and uterus. A C-section may be pre-planned by the mother and her doctor, or it may be necessary for emergency reasons before or during the birthing process. Pregnancy with multiple fetuses, especially if the mother is carrying more than two. What Is a C-Section Error? A C-section mistake is a type of medical malpractice that can cause the mom and child irreparable harm. Doctors and their staff need to adequately monitor a pregnant woman’s progress throughout all trimesters. It is also imperative that the gynecologist talks to the expecting mother about the safest method of delivering her unborn child, depending on her specific situation. A cesarean birth can entail many risks. If you suffered a C-section injury, you need to immediately consult with a medical malpractice attorney who specifically handles these types of cases. One of our experienced lawyers can help you explore your legal options with a free case evaluation. Excessive loss of blood – on average, women lose twice as much blood during Cesarean births than vaginal births. In some cases, the mother may even need a blood transfusion. Damage to the bowels, such as constipation, swelling, and dissention of the bowels. Premature delivery. There are many risks associated with a planned C-section before the mother goes into labor. The main risk to the baby is being born pre-term. Every week a child stays in the fetus longer can make a significant difference. Pre-term babies are smaller and more fragile, and at a greater risk to sustaining injuries during a C-section delivery. Delayed decision to perform a C-section. One of the most common injuries associated with a cesarean delivery is caused by the delayed decision to perform a C-section. If the physician fails to timely perform a C-section, the baby can suffer serious physical injuries and oxygen deprivation. Medical errors during a C-section. One of the risks of a cesarean delivery is the doctor injuring the child while performing the C-section surgery. Common fetal injuries include: skin lacerations, clavicle (collar bone) fractures, skull fractures, facial nerve palsy, Brachial plexus injuries (injury to the nerves that travel from the spinal cord in the neck down the arm). If you believe that your child suffers signs related to a C-section injury, you should consult with an attorney who can provide you with more guidance as to whether you have a viable medical malpractice claim. The seasoned birth injury attorneys at Gersowitz Libo & Korek, P.C. have the experience to help you determine whether you have a valid claim and help you obtain the full extent of compensation you deserve. If your child was the victim of cesarean delivery injury in New York or New Jersey, you need a good attorney on your side. The legal team at Gersowitz Libo & Korek, P.C. understands the ramifications of birth injuries on the lives of the victim and their family members. Our firm has been protecting the rights of victims for more than 30 years. We aggressively litigate these cases to hold the right parties accountable for their actions and help our clients obtain the full compensation that they deserve. Call an Experienced NYC Cesarean Delivery Injury Attorney Today! At Gersowitz Libo & Korek, P.C., we understand how devastating it is for parents when a newborn has suffered serious injuries during the birth process. If you suspect your infant’s birth injuries were caused by medical negligence, please call us at 1-800-529-9997 for a free consultation to discuss the details of your case.